The Navy Office was erected on the site of Lumley House, formerly belonging to the Fratres Sancta Crucis (or Crutched Friars), and all business connected with naval concerns was transacted there till its removal to Somerset House.—The ground was afterwards occupied by the East India Company’s warehouses. The civil business of the Admiralty was removed from Somerset House to Spring Gardens in 1869. This was the location of the Navy Board http://www.pepysdiary.com/encyclopedia/482/ from 1654 to 1673. 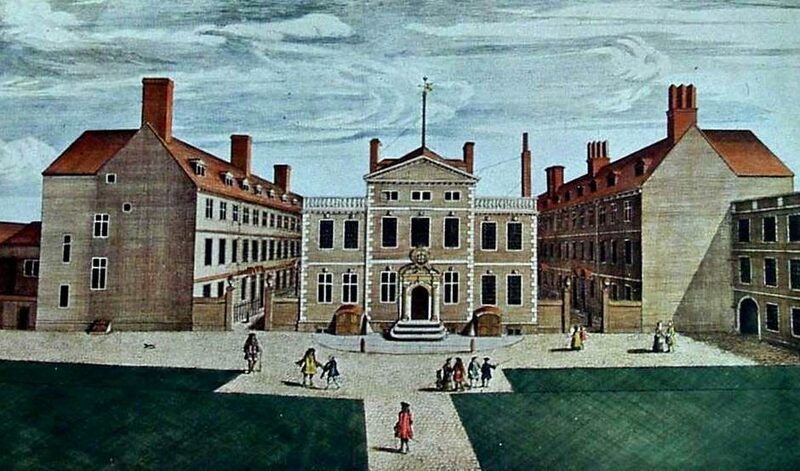 Latham's Companion describes its location as "the northern section of a large house on the e. side of Seething Lane, a few doors south of its junction with Crutched Friars, with a courtyard opening onto the Lane and garden stretching from the Lane to the n.-w. corner of Tower Hill." From the map one can see there is now a Pepys Street at this location! I was in London in February, and went to look at Seething Lane, which is just around the corner from the Tower of London, to see if anything remotely pepysian was still there. The only link to Pepys remaining on the street is St Olave's church, which has a placard mentioning that it is the local church Pepys attended. There is now a Pepys Street running off of Seething Lane. I did not know about the Pepys exhibit until my last day in London, and missed it. Am now kicking myself! I worked for some years in the [pretty dreadful] 1960s building now occupying the site... called Mariner House. It is immediately behind the Port of London Authority building which was built on the frontage to the Tower in Victorian times. I loved exploring the lanes and byways of the City... recommended to visitors. Seething Lane has a little hidaway for those who may want to have strong water in a brown paper bag listening to all those ghosts. On London city site of pocket parks. http://www.squaremiletimes2.co.uk/features/sunb... Lane Gardens. - this garden is on the former site of the former Naval Office and official residence of the Clerk of the Acts. Samuel Pepys resided here from July 1660 and is buried in nearby St Olave’s Church. A sculptured head of Pepys can be seen in the garden. Another note about the area... on Crutched Friars... incidentally that's pronounced Crutch-ed... there is [on a warm day] still a wonderful smell of spices. The area was so permeated with spice in the 18th and 19th centuries from spice storage that it worked it's way into the brick. Visitors might like to 'smell out'! Fratres Sancta Crucis translates as Brothers (or Friars) of the Holy Cross. I have not come across either name previously but I assume that Crutched is purely a corruption of the word Crucis. Does anyone have any information on this order? What Clerks did at the Navy Office. "On Mondays: collect and abstract all bills of exchange, yards and all Navy Bills for the week past, and examine the same with the Comptroller of the Treasurer's Account. Tuesday examine all invalids and sign their tickets for payment [by the 'Chatham Chest']. Wednesday: all day at the Pay Office. Thursday: with the Comptroller receiving petions of poor seamen run on ships' books, and relieving such as appear just. And examine the transport accounts ... all in my office. Friday, all day at the Pay Office. Saturday: examine all imprest and contingent accounts for the Week. And attend the Board every night to dispatch orders and letters till 9 o'clock. And you know besides all this, that I am at calls [i.e. to pay off a ship when it arrives home], wherever a Commissioner is wanted; am just come from Woolwich paying off the "Rainbow"." - letter written 21 December, 1748. Pepys was more senior than this, of course, but this was what his senior clerks would have had to do as well. You'll note that the Board met regularly in the evenings up until 9 pm. The Garden at the Navy Office. Sue Nicholson. Brian, the Wikipedia entry for Crutched Friars will answer your questions. Whilst your contention of the name derivation could be correct, it is suggested that they were named from a crutch or staff that the carried with them. "They settled in London in 1249, where they gave their name to the locality, near Tower Hill, still called Crutched Friars."